track measured 115 centimetres (45.8 inches). Touted as the world’s most exciting light car, Ford dealers from St. John’s to Victoria were delighted to show off the smart little Anglia in the fall of 1959. Sourced from the Ford Motor Company Limited of Dagenham, England, the little British Ford was a fourth-generation reincarnation of a nameplate that first appeared on the world market in 1940. New from stem to stern, like Rambler, Anglia also used the superior frameless all-steel unit construction. Unlike Rambler, this newest member of the Ford family had been developed in a wind tunnel. most distinctive with its reverse-cant window. Sales staff then enthusiastically told prospective customers they could now “drive ahead in the car of the future.” Front-end styling made use of a wide-grin, slanted grille filled with a fine mesh design into which large turn signals/parking lamps filled the ends. The smile was underscored with a slender bumper. The Anglia’s single headlamps were hooded and kissed with arched brightwork brows. Under the forward-hinging hood one found the new 997-cc (67-cubic inch) overhead-valve engine. Using the popular over-square design for the mill, the efficient engine boasted a hollow cast crankshaft with overlapping journals. The four banger, with its large overhead valves and separate inlet ports created a desirably shaped symmetrical combustion chamber that was thrifty--promising to deliver up to 43 miles per Imperial gallon or 6.57 litres per 100 kilometres. The four-banger generated 41 horsepower at 5000 RPM. With a seven-gallon (31.8-litre) gas tank, the car sailed by many an Irving, Red Rose or Pacific 66 service station without needing a fill-up. The powerful little engine was coupled to a four-speed manual transmission that shifted with the use of a short positive lever. in design, easily fitted for left- or right-hand drive versions. Anglia boasted a capacious cabin with over-wide doors. With 14,381 square centimetres (22.29 square feet) of glass, the greenhouse was vast. The driver sat on modular, tubular-framed bucket seats and enjoyed the elegant and practical design of a twin-pod instrument panel with the controls marked by international visual symbols. Wipers were two-speed and electric. 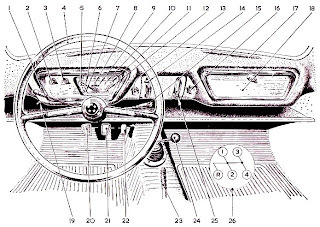 A two-spoke safety steering wheel, twin padded sun visors, and suspended foot controls made driving a veritable joy. A lockable glove box was augmented in typical British fashion with the ever-useful, full-width parcel tray that ran directly under the instrument panel. The car offered more rear seat space than one might expect in such a small car, because of the uniquely positioned reverse “Z”-slant rear window. Consumers were invited to calculate the extra roominess for themselves with a tape measure. Upholstery was nylon, but a nylon and a PVC combo was an extra-cost possibility as was genuine leather. Optional equipment for the Anglia was limited but satisfying. Extra cost goodies included a four-blade cooling fan, a heavy-duty 51-ampere battery, a sump shield, a laminated windshield, a locking cap for the fuel tank, bumper overriders, heavy duty suspension, a fire extinguisher, a fresh-air heater and demister, a cold-air ventilation system, a long- and medium-wave radio receiver, a tool kit, white-wall tires—tubeless or with tubes--were all available for those with a larger wallet. The Anglia two-door sedan sold for $1,538 when introduced in 1959. 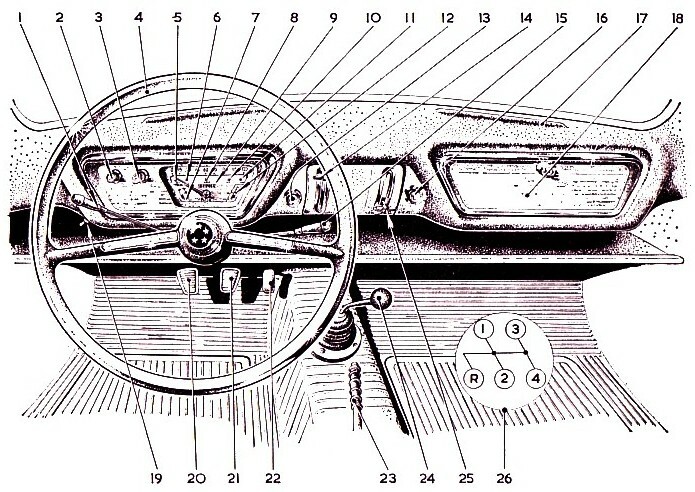 Anglias licensed on or after October 1, 1960 were registered as 1961 models. The Anglia did not stand alone as the sole British Ford in the Canadian dealer’s showroom. 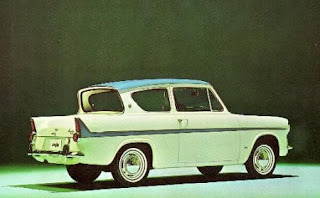 Also imported from Ford’s UK operations were the Consul, Zephyr, Zodiac and Prefect models. Records show that 4,008 Anglias and Prefects were registered during calendar year 1960 as well as 4,810 Zephyrs and Zodiacs and 5,262 Consuls. With a total of 14,080 Fords from Britain registered in Canada during 1960—Oakville records show 15,149 sales—the company boasted it more than tripled its penetration of captive imports in the domestic market. Ford of Canada had a good year in 1960. The popularity of the new, compact Ford Falcon and the Frontenac gave the Blue Oval a huge sales advantage in the domestic small car wars. Having the British and German Fords to sell didn’t hurt one bit. Ground was broken for a $6 million glass plant outside of Niagara Falls. The new head office in Oakville, Ontario was scheduled for completion in April of 1961. Sales for Ford of Canada hit an all time high--$543.7 million—a good five percent more than the previous year.